Day 3: 7am breakfast aka for us vegans bread, jam, and tea. 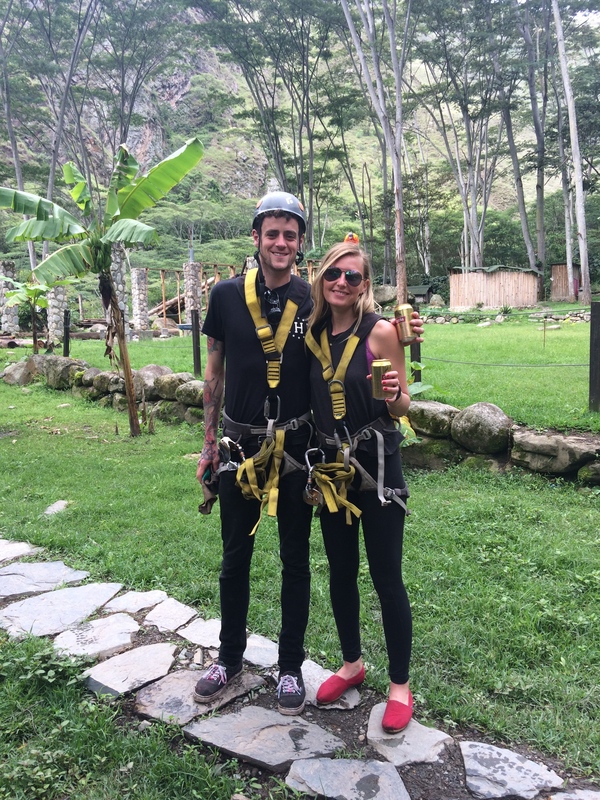 We brought our own avocados and afterwards hopped on the bus to the zip lining spot. By 9am we were clinking beers to cheers St. Patty’s Day and getting strapped in our harnesses. After a 20 minute climb up we arrived at our first line out of six. 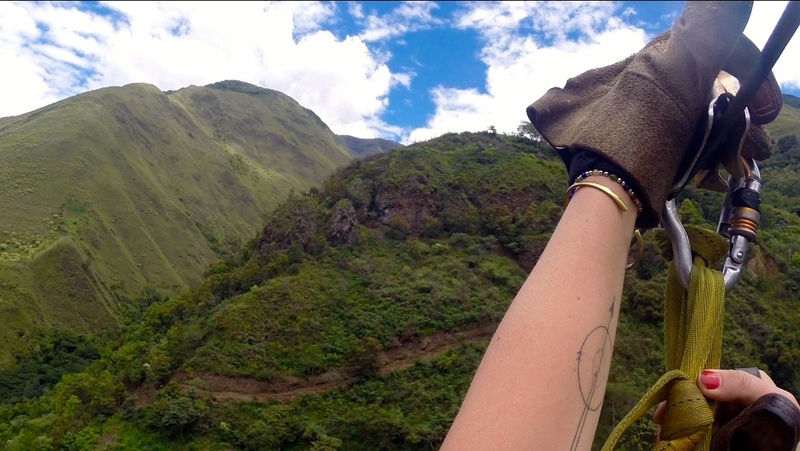 Swinging from mountain to mountain over a beautiful valley with a flowing river was absolutely incredible. I laughed line to line and I made the guys push me to go faster and faster. The fourth zip we had the option of hanging upside down like Spiderman. Insanely incredible. Line five is the fastest and according to the guides you can get up to 50mph (I’d say we went 30mph max). The end of that zip landed you on a tiny wooden platform that rested on the cliffs. It continued to load up with more and more people and the space got cramped. Then we were told to take off our harnesses and flip them around in order to experience the Superman. Two lines sat side by side so you can Superman with a friend. At first it feels odd to completely let go of the line but as soon as you are off it’s amazing. Arms stretched out you soar over tree tops and for a second it’s as if you are truly flying. 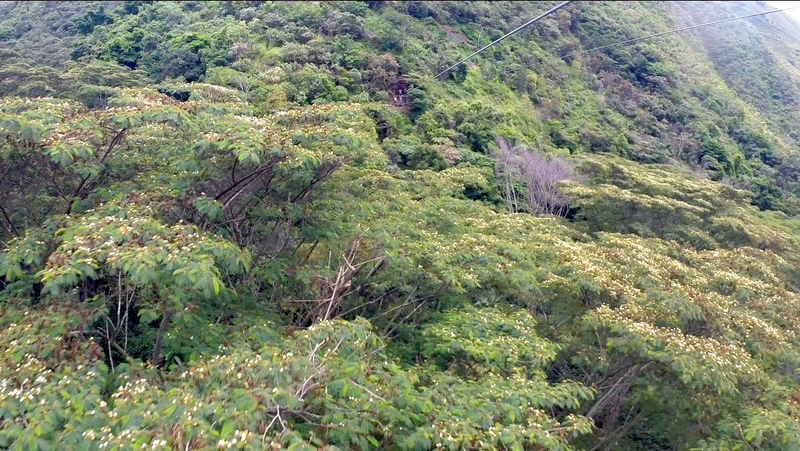 Sadly that concluded our Peruvian zip-line experience and before we knew it we were back on the bus heading to meet the crew who chose to skip out for lunch. Typical lunch and dinners included a type of juice or tea, a veggie soup, and for the main (for us vegans) rice, fries, and a few cooked vegetables or a simple spaghetti. 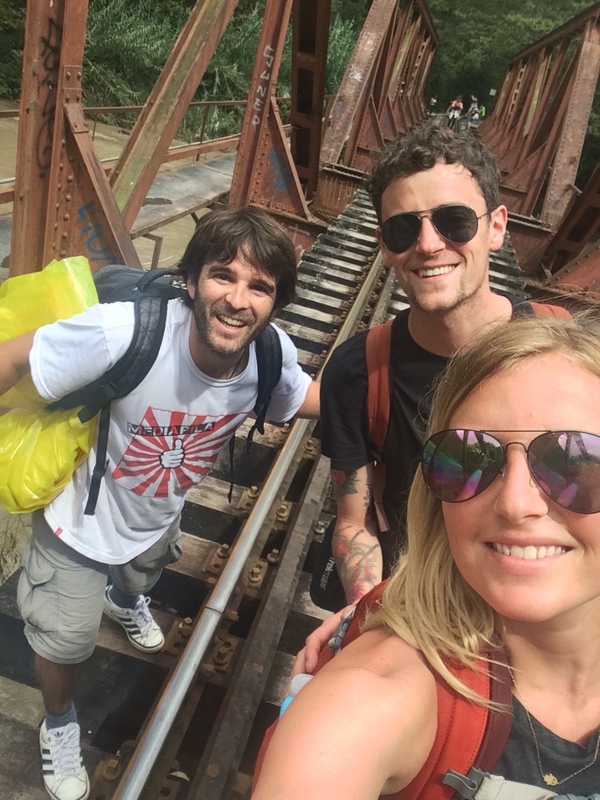 After lunch and a few shared lagers we took off for Aguas Calientes aka Machu Picchu town. This part of the trek is along the railroad and is thankfully an easy, flat two hour walk. Those who choose the train to get to MP must pay around $100 roundtrip and they don’t get to experience all the fun as we did. Fair enough, there are those who cannot trek, or don’t have the time, or just simply don’t mind dishing out that kind of money for a three hour train ride, and that is their choice. Of course it rained on and off as we walked on but we entertained each other by fruit hunting and sharing travel stories. 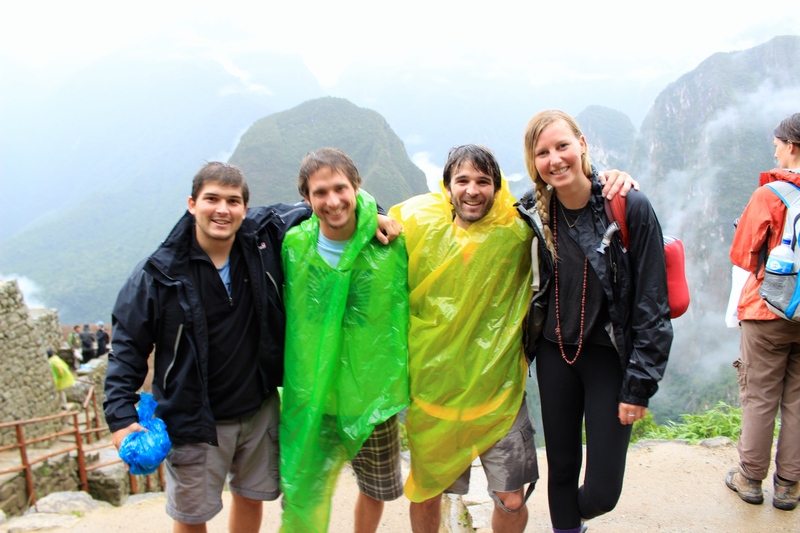 By the time we made it to the town it was pouring and our group split in to two different hostels. The first time we’d have hot water (other than the hot springs) on the entire trip and it felt wonderful to be warm and dry. Unfortunately just about everything we brought on the trip was still damp and due to obvious reasons our hiking boots needed to remain outside our room. That night we had our last meal together as a group and we were fortunate to choose our own three course dinner (salad, soup, and a main) for once on the trip. 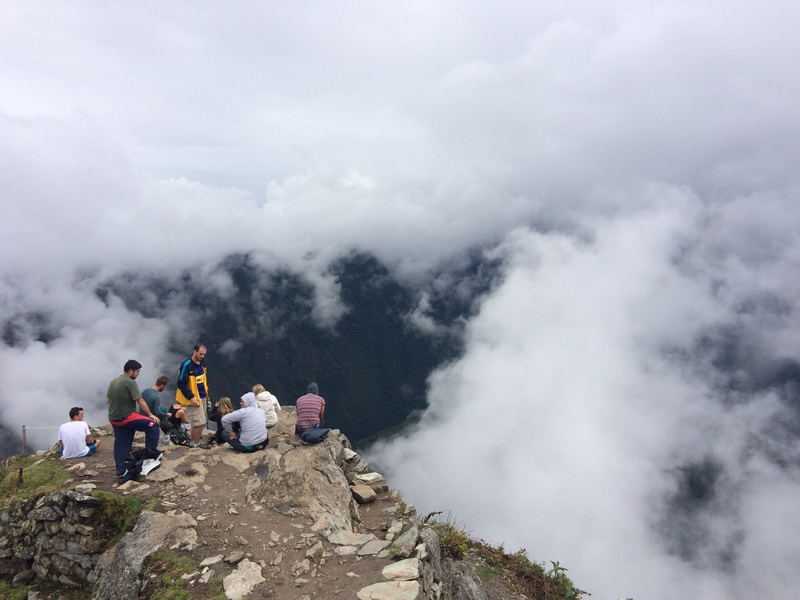 Our group shared more beers and our emails and we promised to meet up in the am to hike the climb to Machu Picchu. Before bed, Ryan and I had our typical “too full must find Fernet” feeling. It had been four whole days without a shot of Italy’s finest amargo and after many attempts, we located a bottle in the town’s karaoke bar. Music blasting, neon lights exploding on the walls, expecting a crowd, but when we crossed the threshold we realized we were the only patrons. The bartender lit up when he saw us and gladly poured us our poison. Stupidly we forgot to ask how much before indulging and ended up paying $20 for four shots (expensive for our stingy wallets). Even though the barkeep begged us to sing a song (my tone-deaf self is never allowed a microphone) we denied and headed off to bed. Alarm went off before 4am and by 4:15am we were out the door. I don’t even need to say it, but yes it was raining. Ponchos on, breakfast tied to our packs, and torches lit, we trudged to the bridge to meet up with our group. Unfortunately the gate to cross the bridge did not open till 5am , but soon enough we were showing our passports and MP tickets to the officials and our 2,000 stair climb began. Mornings are usually tough for me. I can never breathe as well and my stomach is never happy. Regardless, we took step after step slowly peeling away layers as the humidity and the workout increased. As we inclined the sun slowly lit up the sky in a beautiful cerulean blue. When I was just about ready to give up on the stairs, I heard a celebratory scream from above and one minute later I had arrived at the top. By 6am, when the gates open, it was mayhem. People flocking in from buses (the lazy, expensive way costing $12 each way for a 20min drive) and long lines forming at the gates. We found our tour guides and cheered on our group as they completed the climb. We split up in to English and Spanish speaking tours and we ended up with a brilliant guide. 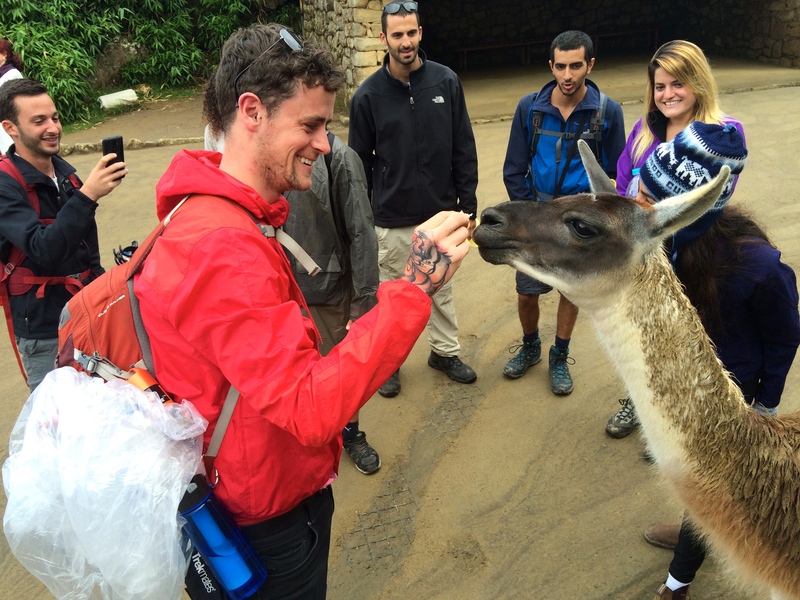 He absolutely loved Machu Picchu sharing as much knowledge as he had on the ancient ruins. The view walking in took your breath away. Mountains protecting us in every direction and terraces and stone buildings stretching across the site. The rain eventually stopped and the clouds creeped in making it an eerie, mysterious place. 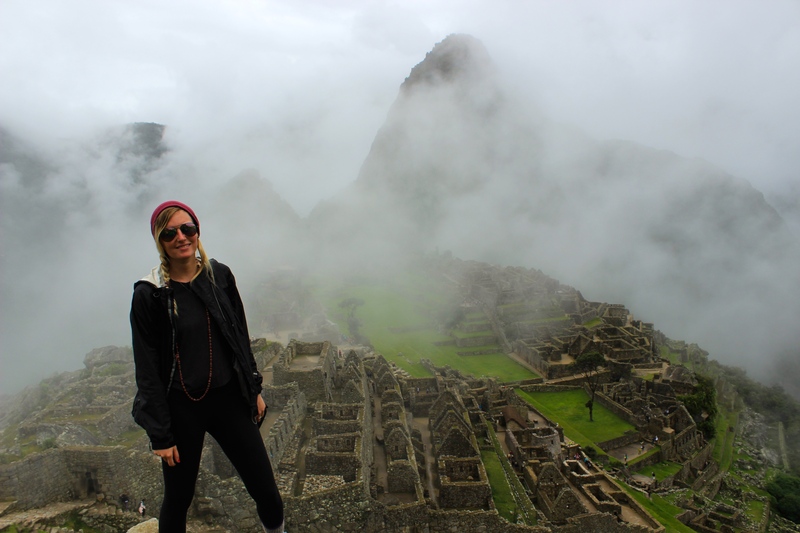 We followed around our guide who showed us how intelligent the Incas were in construction. 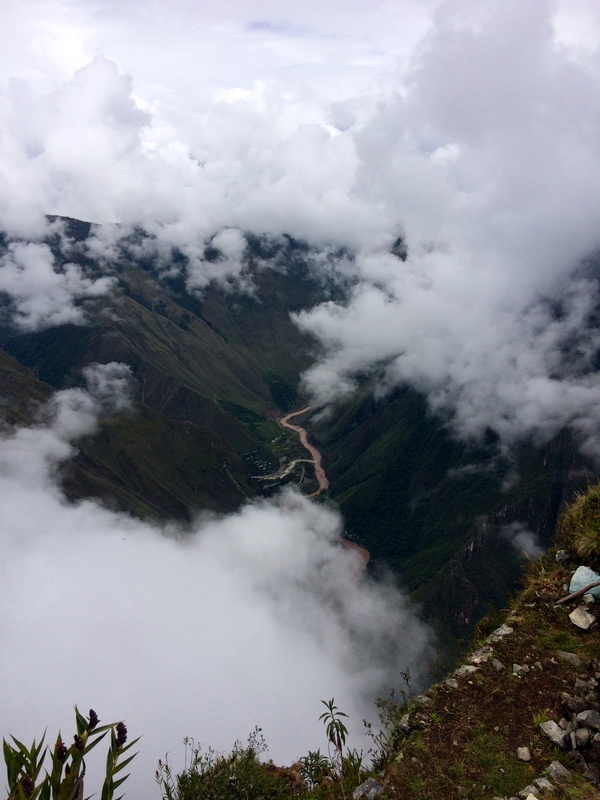 Built in the mid 1400’s most archaeologists believe it was built for the Inca emperor. The stonework is incredible. They carved out slanted stones and layered them in a way to avoid damage from earthquakes and other natural disasters. It is easy to identify an important or royal building from a regular home by looking at the style of how they designed it. The Temple of the Sun is dedicated to their sun god, Inti, and contains two water mirrors in order to observe the sky and stars to predict the weather seasons. The brilliant engineers created a aqueduct to provide water to all and this source still works today. We drank from it and the water tasted perfect. 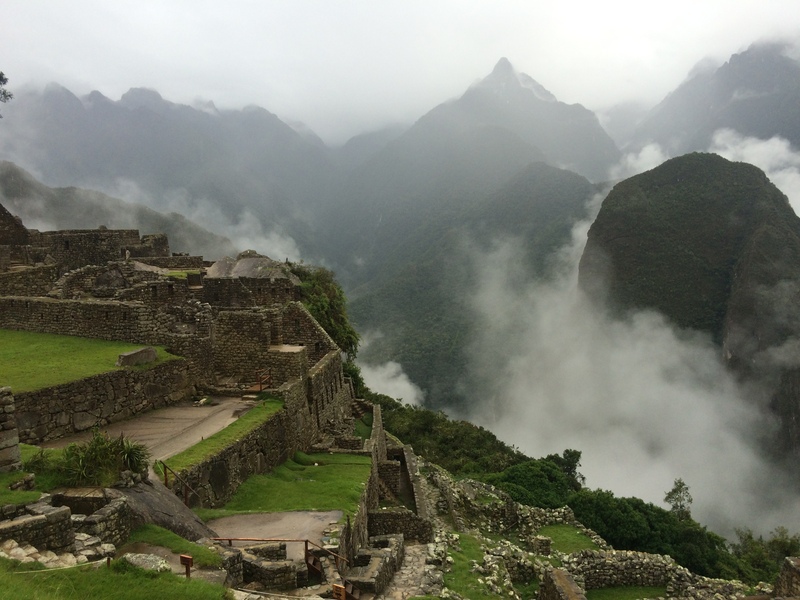 It amazes me that Machu Picchu remained hidden during the Spanish Conquest and it was only discovered 100 years ago. After learning all this and more we had time to explore on our own. 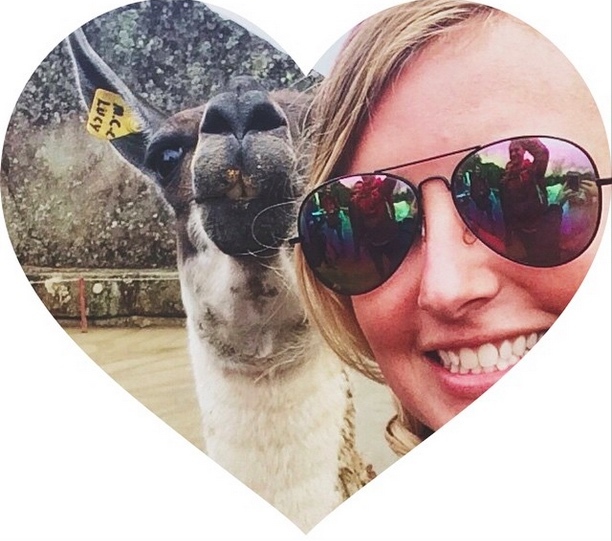 We said hi to the llamas and Ryan of course made friends with one. 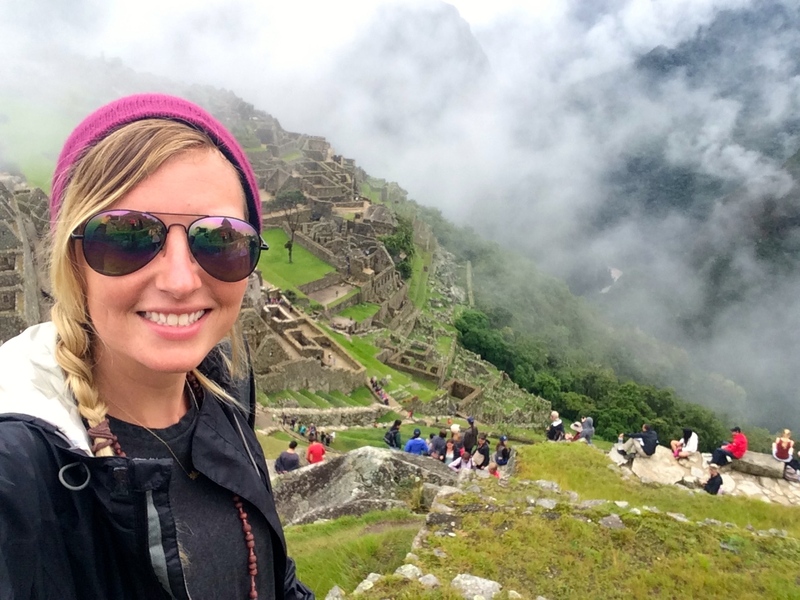 Most went on to visit the famous tourist picture spot and check out the other side of the mountain, but Ryan and I had purchased tickets to climb Machu Picchu mountain. 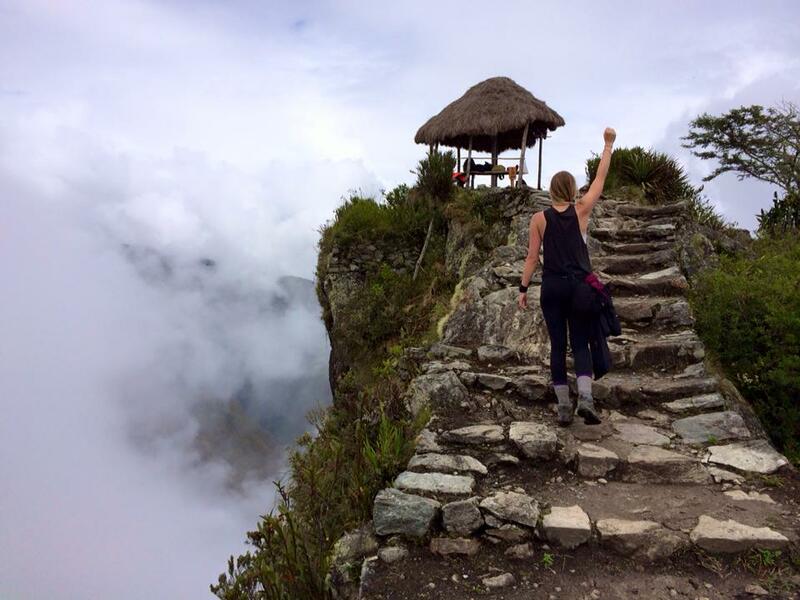 Most tourists choose to climb Wayna Picchu, meaning young mountain in Quechua (the Incan language), which looks down upon the famous ruins. Unfortunately, but for a good reason, they only sell 400 tickets a day in order to preserve the site and when Ryan and I booked our day was sold out. 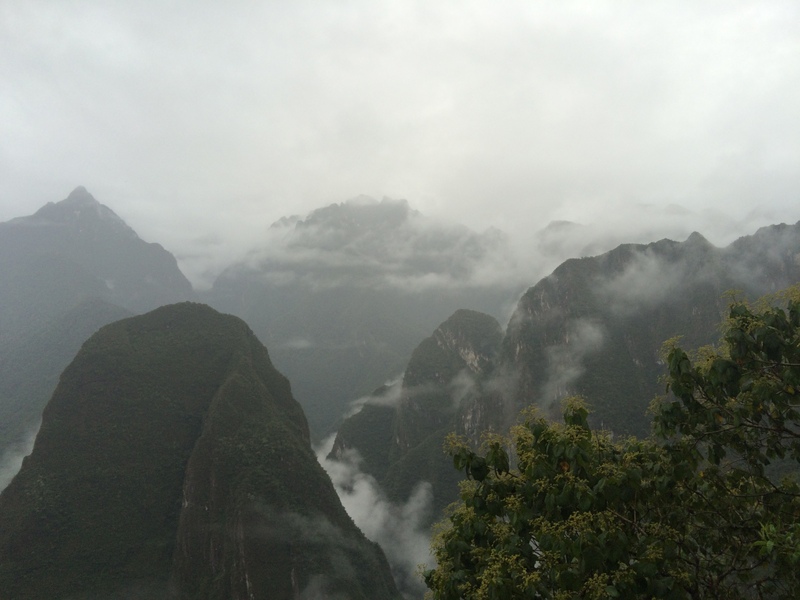 The travel agent mentioned opting for Machu Picchu mountain, the old mountain, that towered above both at 3080m (10,105ft). 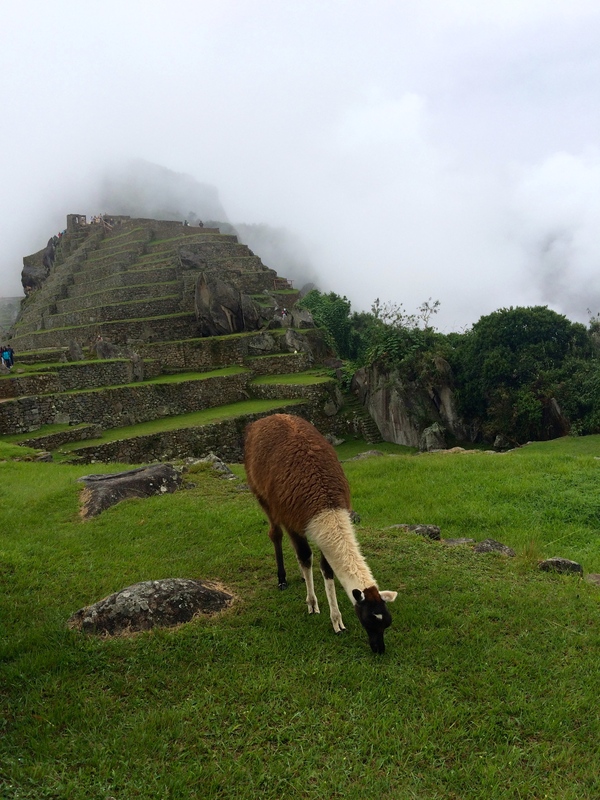 Because there was no written evidence of the Inca city, the actual name of the ruins was never discovered. Machu Picchu is actually the mountain behind the ruins and archaeologists decided to call the Inca city by this name. 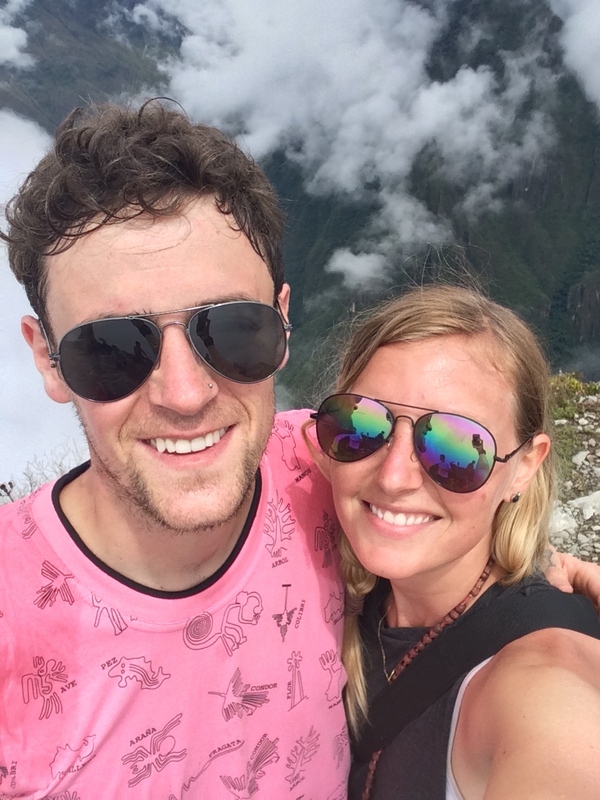 Ryan and I can actually say we climbed the real Machu Picchu, although the intense hour and half climb up a steep staircase was not too fun. A few times we thought about giving up. 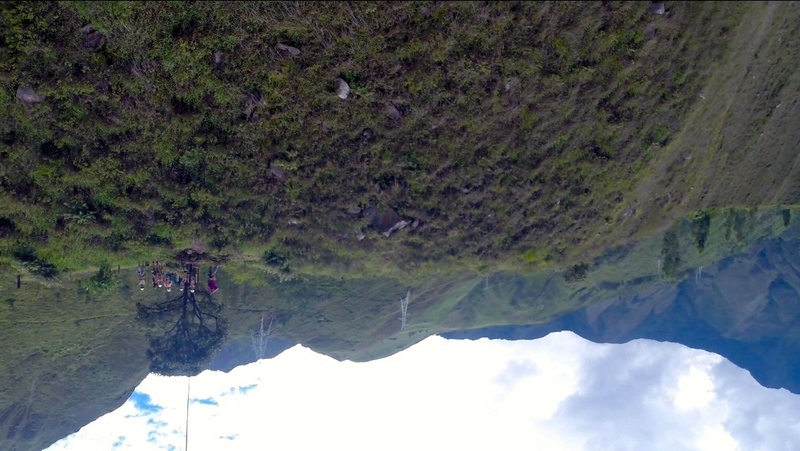 We had trekked for four days and already spent our morning climbing stairs, did we really need to see the top? Then someone would pass us and we’d stay “ok, let’s go up a bit farther” and after 90 minutes of stairs we made it. The top jetted out over the ruins and the clouds moved in and out revealing what lies below. Unfortunately no Inca site in sight, but we could see the town of Aguas Calientes to the start of yesterday’s walk down the railroad. We hung out for a bit with other exhausted tourists and after 20 minutes headed back down. Climbing stairs is hell. Descending stairs is almost as bad especially when the wide steps slant the opposite way and it’s impossible to move as quickly as you would hope. We carefully made our way down and cheered on people going the opposite direction. Everyone asked, “how much further” and we’d give our best guess. It felt guiltily great not to be in their shoes even though I had just done the same thing. Thirty minutes later, calves burning, we made it to the bottom and immediately walked in to crowds of tourists. People everywhere taking photos and moving slow in groups made me thank our tour guides for getting us here when the gates open. Annoyed of the foreigners, Ryan and I weaved in and out of everyone until we reached the exit. 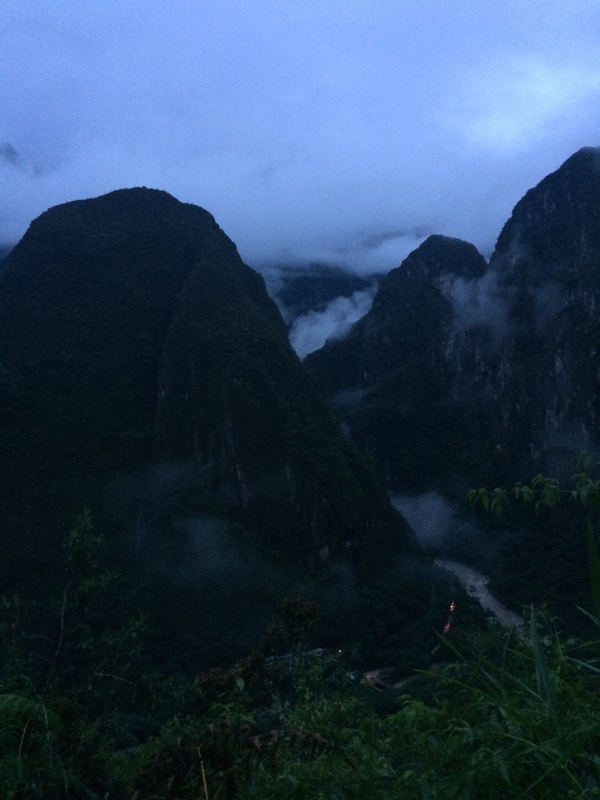 There are no bathrooms inside Machu Picchu so if you do need the toilet, you must leave and reenter. I held my pee the entire 5+ hours to avoid this and gladly paid 1 sol ($.33) to use the facility. It’s a tourist frenzy outside the gates and every vendor is robbing the visitors with outrageous prices. Ryan paid $4 for a soda (a bottle of water costed the same) and we took off to once again climb down stairs. 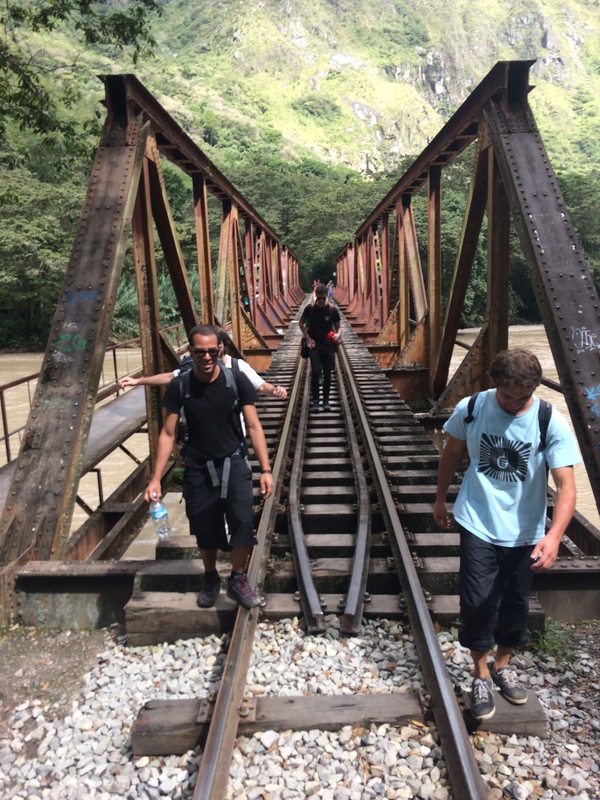 Most people book a train out of Machu Picchu especially after spending days trekking and touring the Inca village, but we opted out and went for the cheaper option; walking back to hideroelectrica. 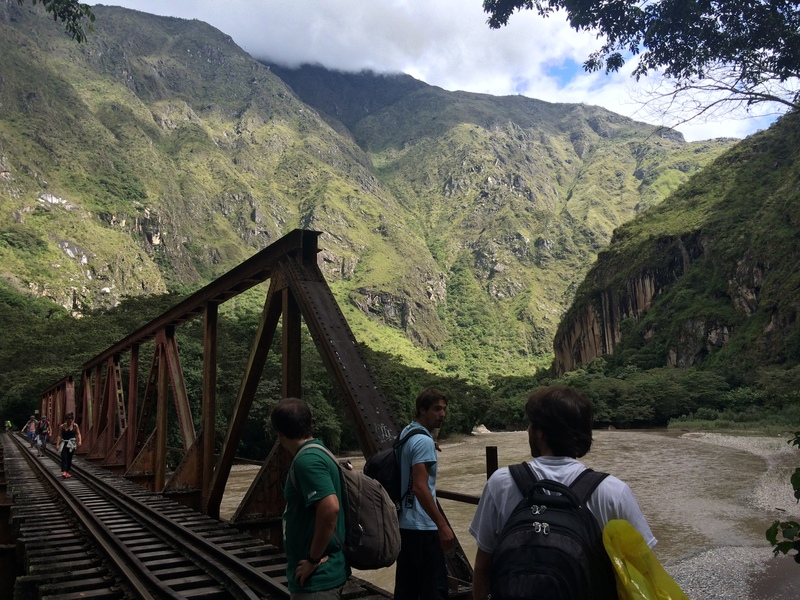 Two hours walking along the train tracks again in the rain until we reached our lunch spot from the day before where we shoveled a three course meal down (10 soles/$3.33) washed it down with a beer and headed to the bridge to find a ride back to Cusco. Luckily a station wagon had two seats open heading for Cusco and we immediately drove off. When rocking up to a collectiva you sometimes have to wait up to an hour until the van fills up. Our driver told us our ride was direct to Cusco, yet when arriving in Santa Maria we were shuffled in to another car. And we sat there over an hour begging the driver to leave. Finally the almost full van of annoyed customers took off and three long, bumpy hours later we arrived in Cusco. Half asleep we returned to our home away from home, Intro Hostel. While checking in, I realized my iPhone was not with me. I had left it in the backseat of the van. I dropped everything and sprinted out the door. I remembered hearing they were stopping in San Fran plaza which was just a few blocks downhill from the hostel. With every bit of energy I flew down to the square. Eyes wide in search of the van, I prayed all the way down getting weird looks and even a “slow down” from a passerby. From a distance I saw one pulling away about to turn the corner and disappear forever. I bolted down to it and banged on the window when I recognized the driver. He pulled over and out of breath I mumbled some words about my phone. I climbed in and THANK PACHAMAMA it was still there! 10 seconds later and my phone would have been gone for good. A great way to end a brutal, exhausting day but hey I climbed some mountains, explored 15th century ruins, and my legs got the workout of their life. After a tall glass of red wine, I happily climbed into my bunk with no alarm clock to wake me up.